The Kansas high school football season kicked off across the state on Friday night and a couple of highly-touted games lived up to their billing. The top-ranked team in Class 5A, Salina South scored on a 3-yard touchdown run by tailback Mike Jones with just six seconds remaining to top Class 6A’s top-ranked Derby, 41-35. After dominating for much of the first half, the South Cougars appeared to be losing all momentum in the fourth quarter. Derby’s Tyler West scored from 7-yards out to pull the Panthers to within 35-28 with 7:53 remaining in the game. Derby coach Brandon Clark gambled with an onside kick on the ensuing kickoff and the Panthers’ Tim Williamson recovered at the Salina South 49-yard line. One play later it was West sprinting down the left sideline for a 49-yard, game-tying score. South battled several cramps and other injuries late in the game, including losing the services of senior quarterback Justin Stonebraker. Dalton Wassenberg replaced Stonebraker under center, but couldn't initially ignite the Cougar offense. Derby gambled again with 2:45 left by going for a 4th-and-short on their own 40-yard line. West and Panther quarterback Jeremy Dunham appeared indecisive on the handoff. The ball fell to the ground, and South was in business. Facing a third-and 11, Wassenberg hit Zach Nachbar on a short pass. The senior receiver broke the grasp of four Derby tacklers for an 18-yard gain down to the Panther 24-yard line. A few plays later, South had the ball first-and-goal at the Panther six with 47 seconds left. The clock continued to run as the Cougars calmly walked to the line, handed to their star tailback, and celebrated shortly after Jones plunged in from three yards out with just six seconds remaining on the clock. It was a dramatic ending to a game that seemed headed for anything but that in the first half. South took the opening kick and over seven minutes off the clock before Stonebraker hit Nachbar on a 17-yard touchdown pass to lead 7-0. Derby struck immediately as Williamson returned the ensuing kickoff 75 yards for a score. After a short Ryan Fox touchdown run and the second Stonebraker to Nachbar 17-yard connection, South led 21-7 with 6:51 remaining in the first half. The Cougars had run 35 offensive plays to Derby’s three. It got worse for the Panthers as South’s Ethan Mitchell forced a fumble that was picked up and returned 30 yards by Braden Burlew for a 28-7 lead. Salina South recovered an ensuing squib kick, but couldn’t convert it into points. Derby pulled within 28-14 at halftime on a Dunham to DeAndre Goolsby 27-yard connection. South extended their lead early in the third quarter when Jones sprinted free for a 61-yard touchdown run, but West brought the Panthers back with three consecutive touchdown runs to tie the game. Jones finished with more than 200 yards on the ground, while Derby’s West totaled 150 yards and three scores. South will travel to Maize (1-0) next week, while Derby plays at Andover Central (1-0). The fans choice for the Kpreps Game of the Week involved another match-up of team ranked atop their respective classification in Madison (8-Man I) and Baileyville B&B (8-Man II). Like the big school showdown, this one didn’t disappoint. The Bulldogs and Falcons went into overtime tied at 22. Baileyville B&B had the first possession in overtime and score, but was unable to convert the point after touchdown. Madison responded with a touchdown of their own and Dallas Thompson added the extra point to give the Bulldogs the 29-28 win. Madison scored 10 points in the third quarter to pull even after the Falcons had taken a 16-6 halftime advantage. Thompson rushed for a touchdown, threw a touchdown pass to Gavin Beyer, and connected on a 23-yard field goal. Sage Blubaugh added for a pair of touchdowns for Madison. The Falcons were led by senior quarterback Dustin Rottinghaus who threw four touchdown passes. Elsewhere, Eudora edged KC Piper 12-7 in a rematch of last season’s 4A state semifinal. J.T. Howell broke the deciding 54-yard touchdown run off of a reverse with just over a minute to play. In the Eastern Kansas League, 5A No. 5 Blue Valley took advantage of two turnovers and shutout 6A No. 5 Gardner-Edgerton, 28-0. Tiger quarterback Logan Brettell connected on two touchdown passes with Mikey Henson and Chance Nelson added a pair of touchdown runs in the win. Andale rallied from a 21-14 third-quarter deficit to hold on for a 30-28 win at Wichita Collegiate. Indian quarterback Jared Smarsh scored consecutive touchdown runs to give Andale a 30-21 lead. 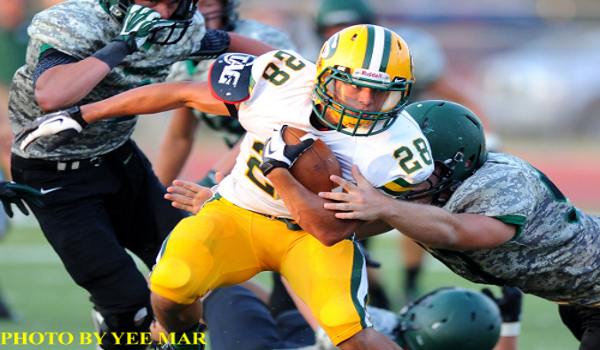 Smarsh rushed for nearly 150 yards on the night. Collegiate quarterback Landon Root passed for 265 yards and a touchdown. Congratulations to the Yates Center Wildcats for snapping a 23-game losing streak with a 48-22 at Sedan on Friday night. Yates Center last victory came September 24, 2010 when the Wildcats beat West Elk 52-28. The Wildcat football program has struggled for several years havnig now posted a 5-77 record since the beginning of the 2004 season.